Jacob Peter Beckley (August 4, 1867 – June 25, 1918), nicknamed "Eagle Eye", was a Major League Baseball player at the turn of the 20th century. He played for several major league teams between 1888 and 1907. He was inducted into the Baseball Hall of Fame by the Veterans Committee in 1971. Beckley was born in Hannibal, Missouri. He was the son of Bernhart and Rosina (Neth) Beckley. Beckley began playing semi-pro baseball while still a teenager. A former Hannibal teammate, Bob Hart, suggested the 18-year-old Beckley to the Leavenworth Oilers (Leavenworth, Kansas) of the Western Association. 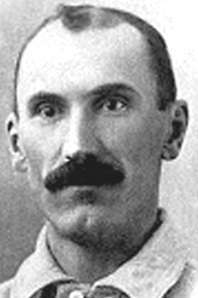 After splitting two seasons between Leavenworth and a team in Lincoln, Nebraska, Jake Beckley's contract was sold to the St. Louis Whites in the Western Association before he was purchased (along with Harry Staley) by the Pittsburgh Alleghenys for $4,500 midway through the 1888 season. After playing one and a half seasons for the Alleghenys, Beckley and eight of his teammates jumped to the Pittsburgh Burghers, a team in the newly formed Players' League (PL). Manager Ned Hanlon crossed over as well. Beckley stated he was willing to go to the PL because after all, "I'm only in this game for the money anyway." The league lasted only one season, and Beckley spent the next five and a half seasons with the Pittsburgh Pirates. His days in Pittsburgh finished, on July 25, 1896, Beckley was traded to the New York Giants for Harry Davis and $1,000. Beckley was released by the Giants the following season on May 22, and he signed as a free agent with the Cincinnati Reds five days later. In his first season with the Reds, Beckley was unsuccessful in getting rookie Honus Wagner out with the hidden ball trick, a tactic he had been known to use against the opposition. But later when Wagner's Louisville Colonels came to play at Cincinnati, Beckley was successful in getting Wagner out, employing a strategy that involved the use of two baseballs. Against the St. Louis Cardinals, Beckley belted three home runs in the same game on September 26, 1897, a feat not again matched until 1922 by Ken Williams. He played with Cincinnati for seven seasons and was later purchased by the St. Louis on February 11, 1904. Beckley retired after the 1907 season with 2,930 career hits, second only to Cap Anson. He continues to rank fourth all-time among major leaguers in triples with 244. As of the 2014 season, Beckley holds the all-time best batting average amongst Pirates first basemen (.300). Beckley married Molly Murphy of Hannibal in 1891. She died of tuberculosis a few months after their wedding. He later remarried. After his playing career ended, Beckley became a player/manager for Kansas City in the American Association in 1908–1909, Bartlesville in the Western Association in 1910, and Hannibal in the Central Association in 1911. He served as an umpire in the Federal League in 1913 and also served as a baseball coach at William Jewell College in Liberty, Missouri. In addition to his umpiring and coaching after retirement from professional play, Beckley operated a grain business in Kansas City. He died of heart disease in Kansas City, Missouri at the age of 50. He was interred at the Riverside Cemetery in Hannibal. Elected into the Baseball Hall of Fame in 1971. Member of Pittsburgh Pirates Hall of Fame. First all-time: Career putouts (23,743). ↑ "Jake Beckley". Baseball Hall of Fame. Retrieved 24 July 2012. 1 2 3 "Jake Beckley Stats". Baseball-Almanac.com. Retrieved 2006-11-21. 1 2 3 4 Fleitz, David (2003). "The Baseball Biography Project – Jake Beckley". Society for American Baseball Research. Retrieved 23 July 2012. 1 2 3 4 5 6 "Jake Beckley". Retrosheet.org. Retrieved 2006-11-21. ↑ Smith, Ira L. (1956). "Baseball's Famous First Basemen". Baseball Digest. New York: A.S. Barnes & Co. Retrieved 23 July 2012. ↑ "Pittsburgh Pirates Statistics at MLB.com". MLB.com. Retrieved 22 July 2012. ↑ "Beckley enters Reds HOF for good reasons". The Cincinnati Enquirer. Retrieved December 23, 2014. ↑ "Jake Beckley". TheDeadballEra.com. Archived from the original on 2006-12-16. Retrieved 2006-11-21. ↑ "Pirates Hall of Fame". Pittsburgh.Pirates.MLB.com. Retrieved 22 July 2012. ↑ "Reds Hall of Fame Announces Class of 2014". Cincinnati.Reds.MLB.com. Retrieved 4 December 2013. 1 2 "Jake Beckley". BaseballHallOfFame.com. Retrieved 2008-09-08.